The winners of the Archiprix International / Hunter Douglas Awards are….. The chairman of the jury, Yung Ho Chang announced the winners during the Award ceremony in New York in a packed Guggenheim with more than 450 guest on June 9th 2011. The winners from left to right: Nicholas Adam Szczepaniak, Gijs Adriaansens, Simone Pizzagalli, Jonathan Enns, Ruann van der Westhuizen, Veronica Rusca, Maurizio Pizzocro, Lorenzo Trompetto, Craig Johnston, Mira Henry (w/o Molly Hunker). Archiprix International is an international network for young, talented architects throughout the world. Biennially we invite all 1400 universities worldwide to select and submit their best graduation projects. 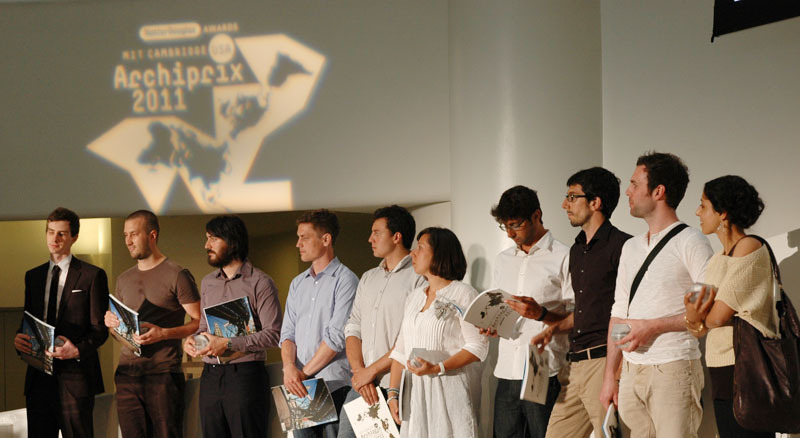 For the 2011 edition held in the United States of America Archiprix International received over 300 projects from 70 countries, a new record number. The jury Yung Ho Chang (Atelier FJCZ and former Dean of the Architecture Department of the MIT), Kapil Gupta (Serie Architects), Xiangning (Sean) Li (Tongi University and director of the Museum of Architecture Shanghai), and Ralph Nelson (LOOM), reviewed all submitted projects and nominated 24 projects for an award. Out of these nominees they selected 8 winners. According to the jury:" The winning projects are related to the DNA of recognizable architects or architectural styles, but they are another evolutionary step beyond that DNA, and stand out because of the authentic voice of the individual designers and the clear positions they take. They are all very powerful projects and go beyond style. What they have in common is poetics".